This secluded glacial lake located just outside of Yosemite National Park boasts scenic views, secluded camping, exotic wildlife, and abundant fishing. Hike scenic Glacier Canyon or explore the regions natural history and geography on the Tioga Tarns Nature Walk. Fish for rainbow trout; the lake is regularly stocked with fish up to 5 lbs. Enjoy secluded lakeside camping, with close proximity to Yosemite. Tioga Lake is a small glacial lake located just outside of Yosemite National Park. This beautiful lake is popular with anglers, hikers, and those looking for a more secluded camping experience. At 9,646, this is one the highest car accessible lakes in the country. From Mammoth Lakes, head north of US 395 about 35 miles to CA-120. Turn left and continue for approximately 11 miles to the lake. CA-120\Tioga Pass Rd closes in the winter. Because of its location on the backside of Yosemite, Tioga Lake is a great place for those looking for some seclusion, while still benefiting from the lush Yosemite-like terrain. The lake boasts 13 maintained campsites. Almost all sites have lake views. Fees are $17.00 per night. Amenities include vault toilets, fire grills, and piped water. 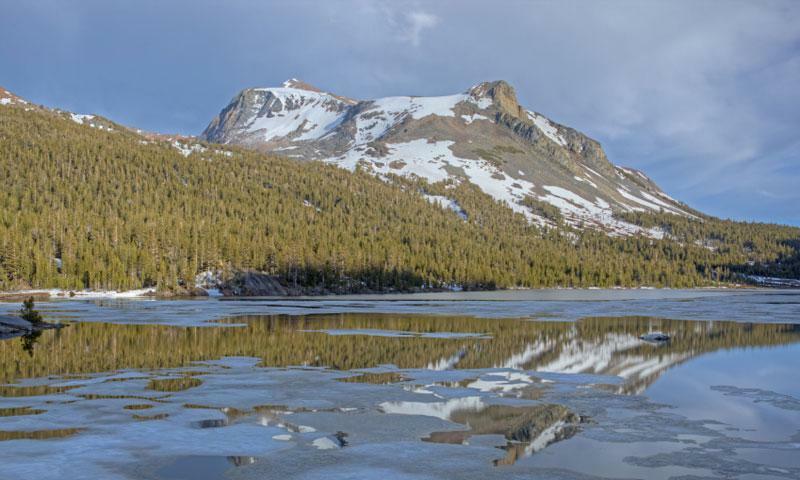 Tioga Lake has lots of opportunity to view Sierra wildlife. Recent sightings have included marmots, bobcats, and big horn sheep. Your best chance for a sighting is usually at dawn or dusk. This small lake is regularly stocked with rainbow trout up to 5 lbs. With Tioga’s proximity to Yosemite, the hiking opportunities are almost endless. We included a few hikes that originate close the lake. Access this trail at the west end of Tioga Lake, then follow the drainage. It’s a 2.3 mile walk on fairly level ground to the end of the Canyon. Just east of Tioga Lake off CA-120 find the Tioga Tarns Nature Walk. This easy walk is well signed and offers insight into the area’s natural history and geography.